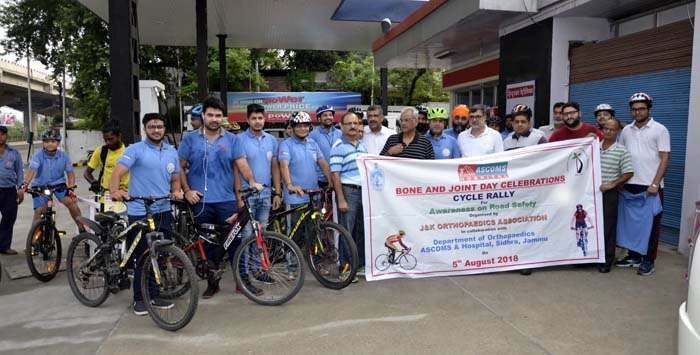 A cycle rally to commemorate National Bone & Joint day was organized by Jammu & Kashmir Orthopaedic Association in collaboration with ASCOMS & Hospital, Sidhra, Jammu on Sunday 5th of August 2018 in which cyclists from all over Jammu region including Jammu Cyclist group participated. The rally was flagged off by Sh. D. K Batra, Joint Secretary & Dr. Pavan Malhotra, Director Principal, ASCOMS & Hospital from H.P petrol pump opposite Hotel Asia. The rally was led by Dr. Rajesh Gupta, Prof. & Head Orthopaedics ASCOMS & Hospital, Sidhra, Jammu. 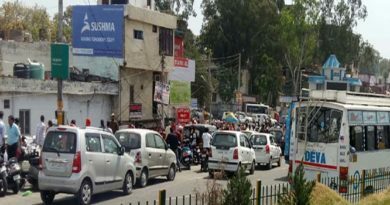 The rally started from Petrol pump entered Green Belt Park, via Bahu Plaza, Railway Station, Garden Estate, Marble Market, and Greater Kailash crossing and culminated at Shree Toyota Complex, Narwal Bye Pass. En-route the rally the pamphlets depicting various aspects of road safety were distributed amongst the general public to create awareness. Mr. Sanjeev Verma, IAS, Divisional Commissioner, Jammu was the Chief Guest on the Valedictory function speaking on the occasion. Mr. Sanjeev Verma appreciated the efforts of Jammu Kashmir Orthopedic Association and ASCOMS & Hospital, to have effectively taken up the issue of great public importance and congratulated the organizers for their efforts to create awareness amongst the public. As this year theme of National Bone & Joint Day was road safety, so this rally was organized to create awareness amongst the people on road safety & traffic rules with a take home message ‘always follow traffic rules to avoid accidents’. Prizes for the best cyclists were distributed by the Chief Guest.